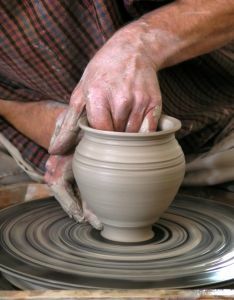 When it comes to worldbuilding, it is best to look at it like pottery. We take a lump of clay and mod it into a shape. Now of course, we could do this just with our hands and nothing else, much like we can just draw on a piece of paper. But there are those of us where we can’t draw to save our lives. Which is why we need something like a pottery wheel. Not that it will do the work for us, but help guide us in design. That is what these tutorials are about, guiding us in design. So, let’s get our pottery wheel so we can make our pottery. There are talented artists who can take a piece of paper and draw up a design and scan it in a computer. There are even some artists you can design a map by hand on a computer with no assistance. I am neither of those people. This tutorial is designed for people who don’t know how to draw, at all. In fact, this tutorial embraces the maxim that it is easier to destroy than to create. 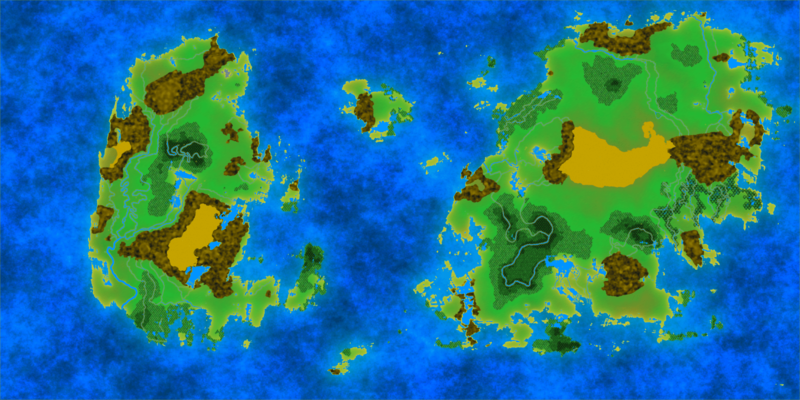 Your eventual goal is to be able to make a map to the quality of the one below. Warning, it is a large file. A final note before we discuss tools. I’m a PC… rather, I’m a PC user. All the tools I know will work with PC. Mac and Linux users who wish to follow along can do so and still get something out of each article, as it will discuss how to use each geographic formation properly in your map and story. However, since I don’t own Mac or Linux, not all these programs will work natively for you and you may require to get additional tools or need special configurations to completely follow along. So lets get underway and talk about the tools we’ll need to make such wonderful maps for your story. The most important tool is Photoshop. Photoshop is a one stop tool that will accomplish everything we need. The only problem is… it’s expensive… very expensive. Once upon a time, it cost close to $1000 for a single license, now you can get it for $50 as a monthly license. If I could use Photoshop, I would. Honestly. However, I dislike paying month to month for software. More than that, I don’t have that kind of money. This article is mostly for indie game developers and self-publishing writers (and people who make Pathfinder maps), and money is the one thing we don’t have a lot of. Our money is needed for other things and spending money on maps is frivolous. So your next best option is getting Paint.net. No that is not a website, that’s the name of the program. The website is getpaint.net. Why Paint.net? Primarily, it’s free. 100%. It also has a fairly low learning curve to get started. Many of the advanced techniques I do, I figured out on my own, and I believe the easy interface allows me to accomplish that. There is GIMP. From what I understand of it, it is closer to what Photoshop is than Paint.net. It is more powerful that Paint.net. However, it does come at a steep learning curve. I tried using it once and had difficulty. This was many years back. I have respect for GIMP, but I use PDN as I’m more familiar with that and can still do the same things. The great thing about PDN, is anything I can’t do, I can usually find a plugin to allow me to do it (though GIMP does the same thing). In the end, use what you feel most comfortable with. With plugins, there are a few things we need to get. First we need to get BoltBaitPack. This will give us more tools than we need, but a few very crucial ones. You will see a part where it asks for money, this is a donation only. You don’t have to give money, but if you can, great. The link is right below the first set of arrows (easy to miss). Next is MadJikPack. Again, a lot of tools, but a few crucial ones. The last tool we need will be Shape3D. This wonderful tool can essentially take a square and make it into a globe (sphere). I’ll let you figure out why that is so wonderful. You’ll note the website is not in english, don’t worry about that, and hit the blue ZIP folder under Mirror. If you are like me and put your programs say your D drive, then you will need to go there instead of C. If you normally put things in C, feel free to do so, I am a power user so I configure my computer a much different way than most. Be sure to look at all the items to get yourself familiar with it. I will try to be exact in my instructions, but it will help if you get yourself familiar with how things work. Pay particular attention to the magic wand and layers. That does it for this article. Next article, we will start building our land masses, and as we get our pictures together, we will be exploring different elements in how they work and why they’re important, expanding from the first article. If you have any questions about what we’ve discussed so far, please ask and I will try to point you in the right direction. Once again, start thinking about what you want in your world. If you’re like me, you don’t know what your final design will be until you see it, and this series of article takes that into consideration… still, get some ideas of what you want for your story.